The Lees of Memory (featuring members of Superdrag) at Burgess Falls photographed by Elvis Wilson. Nineties group Superdrag continue their alternative canon with a new band, new releases, and new re-issues. 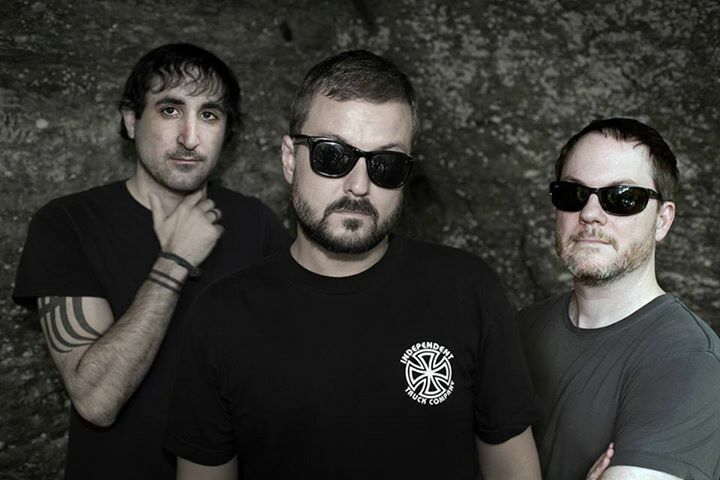 Though Superdrag reunited for a moment in 2009, singer John Davis (also of Epic Ditch) has yet another group, The Lees of Memory, that include Superdrag guitarist Brandon Fischer, drummer Nick Slack, and producer Nick Raskulinecz (both also of Epic Ditch). Next month SideOneDummy and guardians of all things indie Burger Records, will release their debut album Sisyphus Says. But first, turning the clocks back to 1998, SideOneDummy is re-releasing Superdrag’s Head Trip In Every Key on vinyl for the first time, along with the demo companion release of rarities, Jokers w/ Tracers. On The Lees of Memory’s “Not a Second More”, the tape rewinds back in time for you to relive, rewrite, and vandalize the stages and sounds of the early-to-mid 90s. Indulge yourself in the five minute freak out of guitar-glossed-guts and glory where the Knoxville, Tennessee group amplifies an embrace of the immediate. “Not a Second More” angles the boomerang to a time where the early 90s UK independents were eyeballing attempts to break into the American alternative markets, the frenzies of now legendary festivals, to the documented cruxes of commercialized nostalgia. The head trip on The Lees’ “Second More” idolizes the importance and significance in the era that saw the power in chords elevating favorite cult band pulpits like pillars of strength, making the mid-90s feel as close to the present day as if it occurred this past weekend. Following the premiere from The Lees of Memory, we got a chance to catch up with Superdrag vets John Davis and Brandon Fischer in a reflective round of discussion. With the advent of Superdrag’s Head Trip in Every Key being re-issued on vinyl and The Lees of Memory’s Sisyphus Says to follow; looking back, what are some of your favorite memories from around 1998? John: One popped into my mind instantly, so I’ll go with it—it would be Jerry Finn taking me to buy a new Les Paul. We were in town playing at the Hollywood Palladium (5-9-98, supporting Ben Folds Five). Thanks to Jerry, they really rolled out the red carpet for me and let me play five identical guitars and choose the best one. I also remember Tommy Stinson coming out to see the show and hang out afterwards; that still blows my mind. Standing around chit-chatting with one of our heroes, trying to act normal. What is the story behind the The Lees of Memory, and is it a sort allusion to staking a claim as guardians of 90s time capsule re-discovered, and re-jetted? John: Please, anything but that! Ha ha, having me guard the ’90s Time Capsule wouldn’t be a very good idea. I’d never be able to resist vandalizing it in some way. No, the Lees really started with Brandon; he had been writing and wanted to make some 4-track demos. This was in August of 2012. “Deliquesce” was the first one we did. I got on a roll with writing not long afterwards, and for a minute there we were sort of running on parallel lines separately. But the two batches of material were so sympathetic to one another that it just made perfect sense for us to join forces going forward. What things have you felt have shifted from the brainstorming, recording and song composition process in The Lees of Memory, versus the days of Superdrag? John: Well, we don’t live in the same city anymore, so any collaborating on the pre-production side ends up happening via e-mails back-and-forth, etc. We tracked and overdubbed everything guerrilla-style where we’d strategically plan a day or two or three to get as much work done as possible, far in advance; sort of a surgical strike rather than camping out somewhere indefinitely ’til the whole thing’s done. So much has changed, that just isn’t an option for us anymore. Brandon: With Superdrag, we’d typically rehearse songs and play them live before recording them in the studio, so guitar-wise, I had a lot of time to tweak what I was playing. With these songs, the first time I played them with John and Nick was on the tracking floor. So I guess my guitar parts are a little more ‘first-instinct,’ maybe, as compared to Superdrag. Describe the collaborative fusion that The Less employ that made up the songs you hear on Sisyphus Says. John: “Open Your Arms” is a pretty good example; Brandon sent me a demo of his guitar and vocals cut to a click, I flew it into one track of the 4-track and overdubbed drums, bass, synths, second guitar and vocals, added a bridge I had written for it and sent it back. He was stoked on how it came out, so that became the blueprint for what we would eventually do in the studio with Nick (Raskulinecz) and Nick (Slack). Brandon: To me, a lot of it is instinctive. Like, when we demoed “Deliquesce”, I had the guitar and vocal written, and as John was adding in the other instruments (and coming up with their parts), the vibe he was getting was perfect! And when we recorded that one in the studio, I had an overdub guitar part I wanted to add in… I showed Nick the part (on an unplugged guitar), and he immediately knew the exact amp sound to dial in. What is it about the Sisyphusian mythological tale of futility that inspired you all? John: I would say that it neatly sums up the human experience, wouldn’t you? Throw Ecclesiastes 2 into the mix and it’s basically a wrap. I find joy in my family, though, in spite of the cosmic insignificance of ‘toil under the sun’ or whatever, or even making records, for that matter. I mean, from a certain point of view, the world needs another band and another record about like it needs a hole in the head. [Laughs] …and of course we’re part of the problem. Give us the deets on how this release partnership was brokered between SideOneDummy and Burger Records. John: It just sort of happened! Our friend Jeffrey Smith really helped us out, he sent the music around to a bunch of people, including the Burger bros. They were down to do a cassette version, which I was SUPER-stoked on. 4-track cassette recording is at the heart of everything I do, always has been, always will be. Plus, Burger is sick, they do so many interesting things, they’ve worked with lots of great bands from around here (Nashville), plus, they put out Personal & The Pizzas! I mean, come on!!! We jumped at the chance to work with those guys. At the same time, we already had a good relationship with SideOneDummy via these Superdrag reissues; they were just so friendly, so helpful and so easy to deal with, I thought, “why not send them the Soundcloud link and just see what they say?” I think they hollered back the same day! We were definitely on the phone the same week talking about the possibility of a Lees/S1D release. They put a lot of heart and passion into what they do, we feel very fortunate to be involved. They’ve already shown Head Trip… more love than Elektra ever did! Just keepin it 100. What observations have you all made of the alternate, indie scenes of the 90s, and the similarities, differences, and resurgence of interest in the 1990s culture now in 2014, as well as in recent years? John: Man, I don’t know, I guess it was inevitable? I mean, for a long time all the hot new bands sounded like ‘First-Wave-of-MTV’ to me, you know? I loved MTV so much when it came out. [laughs] I was seven years old. But yeah, for a while there, it was like, ‘oh, that’s Men Without Hats!’ ‘That’s DEVO! Duran Duran!’ Then a couple years ago somebody played me the hot new indie rock band (which I would rather not mention by name), and I thought, ‘that sounds exactly like Archers Of Loaf.’ So yeah, it was bound to happen eventually. Brandon: Regarding differences, I think of how so much has changed in terms of getting music ‘out there.’ For an indie band, having an online presence is such a great way to reach an audience. I guess it’s still word-of-mouth, in a sense, but at a much quicker and larger scale. Superdrag’s Head Trip in Every Key will be re-issued on vinyl August 12 and The Lees of Memory’s Sisyphus Says available September 16 from SideOneDummy and on cassette from Burger Records.